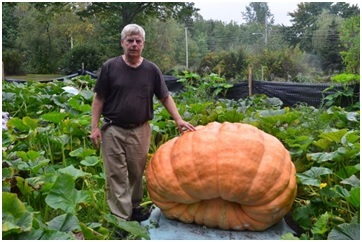 Brian Kenneally of New Minas is getting ready to harvest his giant pumpkin for the Annapolis Valley Giant Vegetable Growers Competition and Weigh-off. NEW MINAS – For one member of the Annapolis Valley Giant Vegetable Growers, it’s all about competing against himself to try to beat his personal best – and having fun. 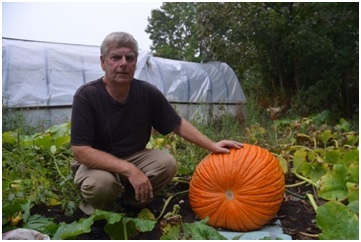 Brian Kenneally of New Minas said in a Sept. 19 interview that he would be harvesting his giant pumpkin and squash in four days, just in time for the association’s annual competition and weigh-off. The AVGVG’s event, sanctioned by the Great Pumpkin Commonwealth, takes place at Glad Gardens in Waterville Sept. 23 from 7 to 9 p.m. and Sept. 24 from 9 a.m. to 2 p.m.
Kenneally said he’d also be entering a giant field pumpkin, long gourd, giant tomato and probably a cabbage. 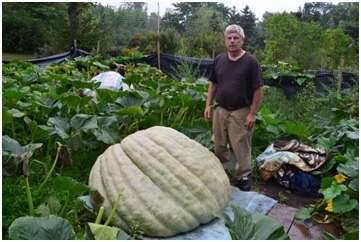 He’s been growing giant vegetables for more than a decade and said he enjoys the competition. He said it isn’t so much the competition with other growers he enjoys as it is trying to beat his personal best. He said he would beat his personal best with his squash, which he expects to be in the top 20 in the world. There aren’t as many people growing giant squash for competitions as there are giant pumpkins. He said his personal best for giant pumpkins is 1,381 pounds while his biggest squash to date was around 400 pounds. This year is only the second year he’ll enter a giant squash. Based on measurements, he estimates that his giant pumpkin and squash entries for this competition will weigh around 1,000 pounds and 900 pounds respectively. He hopes they’ll be in the top two or three spots. Kenneally said he got his seeds germinated in April and had them planted outside by April 26. He used a heating cable in the ground and put small greenhouses over them. “Up here, we’re just a little bit cooler than in the Valley so you have a little bit extra to get them going,” he said. Kenneally said he kept his giant vegetables well watered during dry spells over the summer but you don’t get the same growth with watering as you do with rain. He said there was a cold week in July when his pumpkins were just starting to take form and this set them back. “At day 20 they should measure somewhere around 70 inches and I was at 35 and 38,” Kenneally said. He said they kept growing but didn’t take as dramatic a growth spurt as he’d hoped. You should see pumpkins gaining 40 pounds a day for at least two weeks but Kenneally said his were adding around 30 pounds a day. “It’s great to see how fast they do grow once they start,” he said. Kenneally said the Annapolis Valley Giant Vegetable Growers are always looking for new members. He said people interested in joining should contact the organization and current members would be more than happy to help get them started. – Vegetable pre-judging takes place the evening of Sept. 23. Registration is from 9 to 10 a.m. Sept. 24, followed by the final vegetable judging, pumpkin weighing and the awards and presentations. – The event is free for spectators and features free children’s games and activities. – There will be a barbecue and canteen, raffle draws and a 50-50 draw. – Registration is $15 for adults and free for young gardeners. There will be prizes awarded in 15 categories, for adults and young gardeners 16 years of age and younger. – There will be people’s choice awards and lucky growers prize draws. – For more information on the AVGVG or the upcoming competition and weigh-off, visit www.avgvg.com.